A fully air-conditioned guest room, offering quality and comfort, with private balcony. 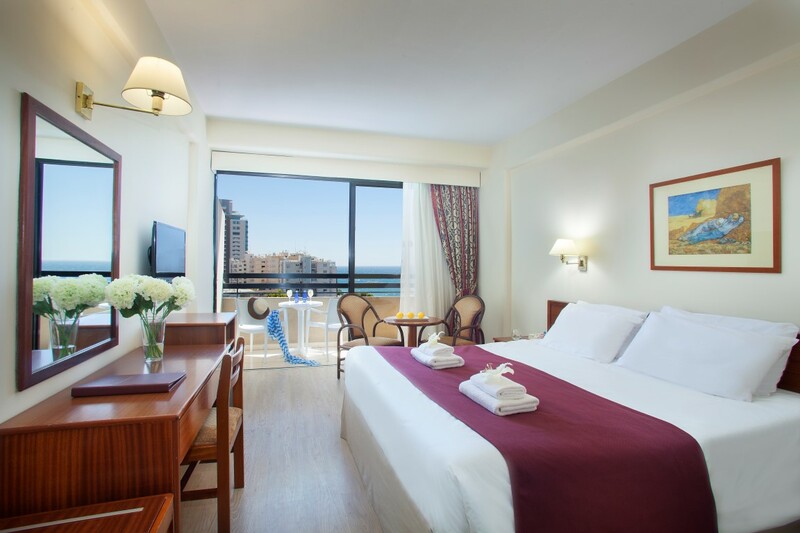 The more spacious superior rooms are located on the first floor. Here you can enjoy the comfort of a lounge area furnished with one three - seater sofa bed, two armchairs, and a coffee table. A private large terrace overlooking the pool with sunbathing facilities is an additional privilege. Room facilities include direct dial telephone, satellite TV, tea and coffee making facilities, free wifi, mini bar and hairdryer. Located on the first floor of the building, our one-bedroom Executive suite features exceptional spaces and elegance. Furnished with an exclusive line of luxurious mahogany furniture this suite provides a king size bed, two bathrooms, and a separate living room with a lounge area and a dining area. Spacious and luxurious bathrooms and branded toiletries are an additional privilege. The hotel offers free wifi in all rooms and communal areas.